Winco WDM004-201 Ardesia Priscila White Melamine Angle Bowl 6-1/2"
TigerChef > Dinnerware > Melamine Dinnerware > Melamine Serveware > Melamine Bowls >< Melamine Serving Bowls > Winco WDM004-201 Ardesia Priscila White Melamine Angle Bowl 6-1/2"
$103.59 Winco WDM004-202 Ardesia Priscila White Melamine Angle Bowl 7-1/4"
$123.99 Winco WDM004-203 Ardesia Priscila White Melamine Angle Bowl 8-1/2"
$90.56 Winco WDM003-201 Ardesia Hailey White Melamine Angle Bowl 12"
$63.00 Winco WDM005-201 Ardesia Elista Melamine White Triangular Bowl 7"
$2.28 Vollrath 52860 Birchwood Melamine Round Serving Bowl 12 oz. $1.84 Vollrath 52861 Black Melamine Round Serving Bowl 12 oz. $1.78 Vollrath 52866 Birchwood Melamine Round Serving Bowl 14 oz. $1.98 Vollrath 52867 Black Melamine Round Serving Bowl 14 oz. $3.46 Vollrath 52869 Birchwood Melamine Round Serving Bowl 34 oz. $40.73 - $52.99 GET Enterprises B-796 Geneva Bowl 6 Qt. Add a simple yet contemporary twist to any table presentation with the Winco WDM004-201 Ardesia Priscila White Melamine Angle Bowl 6-1/2". Perfect for showcasing appetizers, salads, and other specialty dishes, this break-resistant bowl is designed with a smooth surface and angled rim that beautifully frames food and increases product visibility. 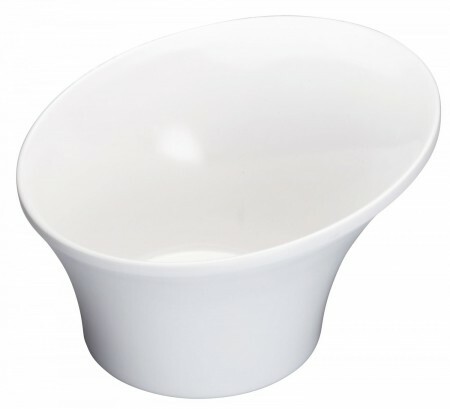 Thanks to its footed, sturdy base, this NSF listed bowl sits flat on any table top for excellent stability. Perfect for both informal and formal dining, this professional quality melamine bowl combines delicate appearance with unbeatable durability.